﻿A Jerusalem Post article of October 5 ("IDF: West Bank Terror Could Re-emerge," by Yaakov Katz)claimed that senior defense officials are warning about an eventual escalation in terror emanating from Hamas and Islamic Jihad cells in the West Bank in the face of "the lack of diplomatic progress." While the article contains no direct quotes to this effect from any senior officers, the implication is that upper echelons of the IDF view "diplomatic progress" as an alternative to Israel's being subjected to a terror offensive. No doubt during the Oslo years promotions to the highest positions in the IDF were made in part on the basis of political views. 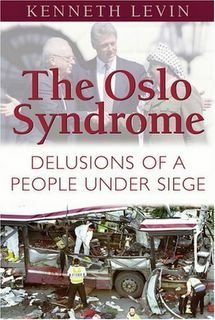 And, despite all that has transpired, the delusions of Oslo still have a tenacious hold on some Israelis. But, especially since Arafat launched his terror war in September, 2000, the nation should surely have moved well beyond the point where anyone in a position of authority in the IDF would still fail to grasp basic realities. There are, of course, no Palestinian interlocutors for diplomatic progress that would improve Israel's security, and any territorial concessions in the foreseeable future will simply provide the terror organizations with better strategic positions from which to launch their attacks. As the war with Hezbollah this summer underscored, Israel cannot afford the luxury of delusional misconceptions about the objectives of its enemies and the strategic threats they represent.